Posted in: BSU MSE Seminar. Tagged: insects, physics. 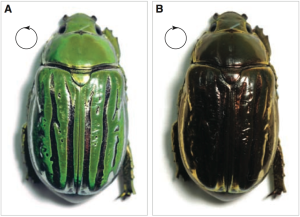 Coloration of a jeweled beetle in light with left-handed (a) and right-handed (b) circular polarization. From Sharma et al. Science 325, 449 (2009). Fascinating talk this morning from Prof. Srinivasarao of Ga Tech in the Material Sciences and Engineering Seminar about the physics of animal coloration. 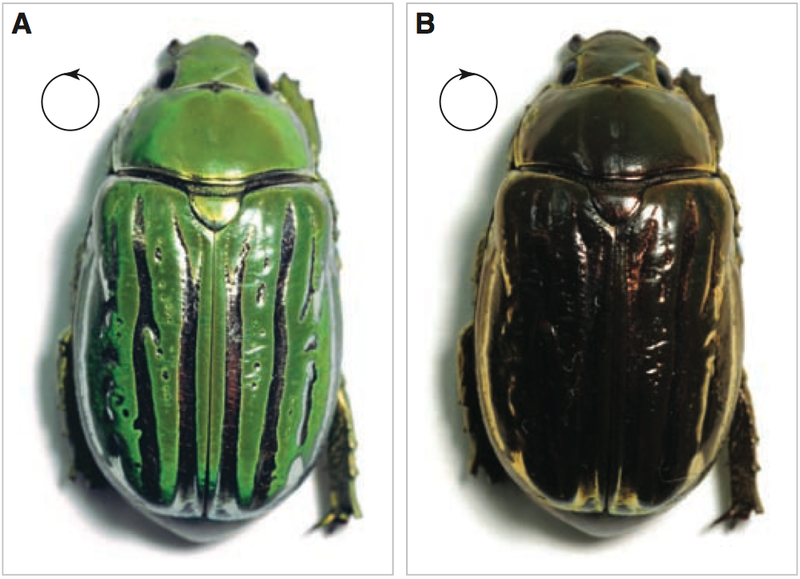 Turns out the brilliant and iridescent coloration displayed by many insects and other animals is not due to dyes or pigments. Rather it’s due to micro- and nano-scale structures in animals’ scales or exoskeletons. These small structures combine polarization, reflection, and other subtle light manipulations to produce their complex and dazzling color displays. Prof. Srinivasarao studies these processes and how we can replicate them in his lab. Here’s a recent publication from his lab.